As the word spread about the newly formed Table Tennis Association so did the popularity of Table Tennis as a recreation and sporting activity in Traralgon. Membership increased and soon the newly created Association began to attract a number of constituent clubs. The Clubs came from a complete cross section of the local community and included church groups, small business groups, and larger local industry work groups like the Victorian Railways Institute, SECV and APM. The continual increasing interest and participating numbers now presented the Association with a new challenge; how can all these people be accommodated and where can all these people play? Facilities were at a premium and in the attempt to accommodate all players, the Traralgon Association moved to a variety of venues and during the course of time had many homes. In the early days these included a variety of church halls and the larger Victorian Railways Institute (VRI) hall in Traralgon. In late 1981 the concept of exclusively veterans Table Tennis competitions began with the first Veteran Elite Championships being played at Melbourne’s Albert Park Table Tennis Complex. The popularity of this component of the sport grew steadily and in the early 1990’s Traralgon developed a proposal to also offer exclusively Veteran competition. In mid 1992 Traralgon Table Tennis Association conducted its first exclusive Veterans Pennant Competition. After a number of years of not being involved in running state level tournaments the Traralgon Association returned to the Victorian Tournament circuit in 1993 with a complete range of Senior, Junior and Veteran Tournaments. The Traralgon Tournaments soon established their place as highly regarded events that attracted the top players from throughout Australia. The Senior Open Tournament fields have included both Men’s and Women’s National Champions including Australian Olympic representatives. The Traralgon Senior Open title holders were also the national title holders. 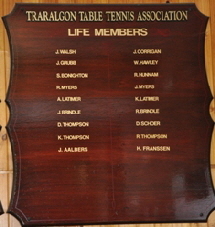 In 1999 the Traralgon Association celebrated its 50th Anniversary as an operating Table Tennis Association. This milestone was celebrated with a large reunion dinner in Traralgon for all past and present members. The sport of Table Tennis continued to see customary support in Traralgon and with regular pennant competitions and state level tournaments the capacity of the ten table stadium was frequently stretched. Expanded facilities were again on the agenda and in 2000 the Traralgon Association constructed the new International Wing stadium extension. The stadium extension provided the Traralgon Association with an additional four full sized ITTF international sized courts. In late 2003 the Traralgon Table Tennis Association began to develop Keenagers Table Tennis as an extension of social Table Tennis for senior players. Keenagers Social Table Tennis commenced during seniors week in March 2004 catering primarily, but not exclusively, for all players aged 50 and over. Keenagers recreational Table Tennis continues today with growing support. May 2006 - Latrobe City table tennis team visit Taizhou in China to compete in several table tennis matches. The team also made visits to local schools to experience the lifestyle and educational differences in their sister city. On 25 -26 July 2009 the Association held a Diamond Anniversary Tournament and celebration of the club’s 60 years. Contestants from across Victoria enjoyed competition in Senior, Junior and Keenager and Novelty Tournaments. Saturday night we enjoyed an exhibition match by members of the Australian Team and our own champion Mick Warr followed by BBQ and drinks courtesy of the Soccer Club bar next door. All competitors received a 60th Anniversary medallion at the Winner’s Presentation on Sunday. The Association conducts annual Open Tournaments as part of the Victorian Circuit Calendar in addition to a variety of Regional Closed events. Traralgon Town Hall (centre). 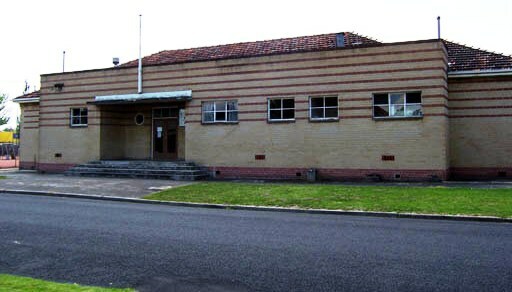 A former venue for Traralgon Table Tennis Association during the 1950s. This beautiful building was demolished in 1972. Victorian Railways Institute Hall, Traralgon. One of the former venues for the Traralgon Table Tennis Association.